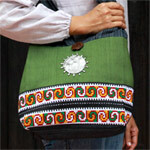 The Lanna bags artisans craft this shoulder bag by hand. They decorate the bottom with a ribbon embroidered by Yao ethnic minority women and stitch in the center an aluminum medallion engraved with an elephant. Lined with cotton, the interior has one pocket. 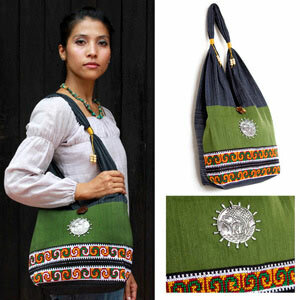 The bag closes with a hoop over an elephant button carved from coconut shell. Materials: 100% cotton, polyester cords, aluminum, coconut shell and rain tree wood. Lining 100% cotton.